Out of all the slime recipes we have made so far, this has to be one of the prettiest slimes you can make! Well, our unicorn slime is one of our favorites too but the colors on this slime are just so fun! 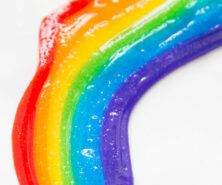 You can have a lot of fun mixing up this Rainbow Slime for a great sensory activity for kids. 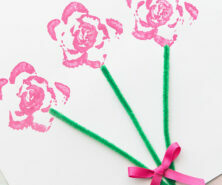 This is perfect for a spring activity, St Patrick’s Day or even just a rainy day indoor activity! 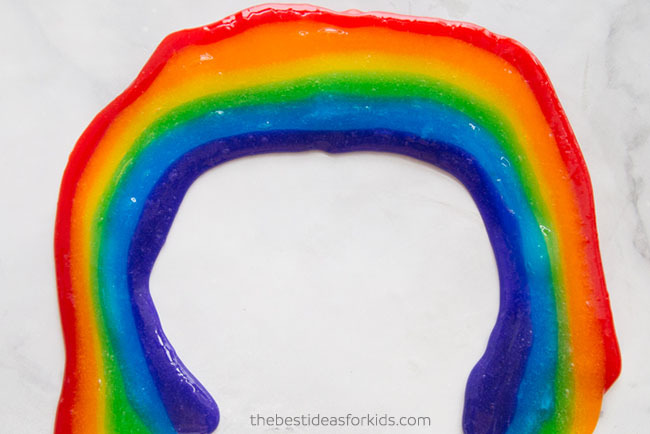 This Rainbow Slime is so colorful and fun to make! 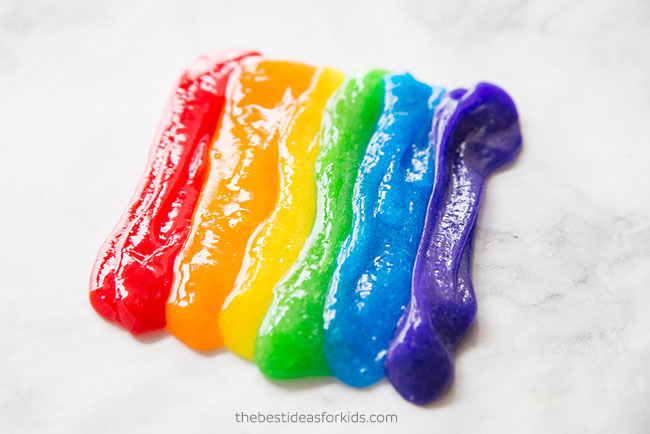 Kids will love helping to make this slime. We just love how vibrant the colors are! 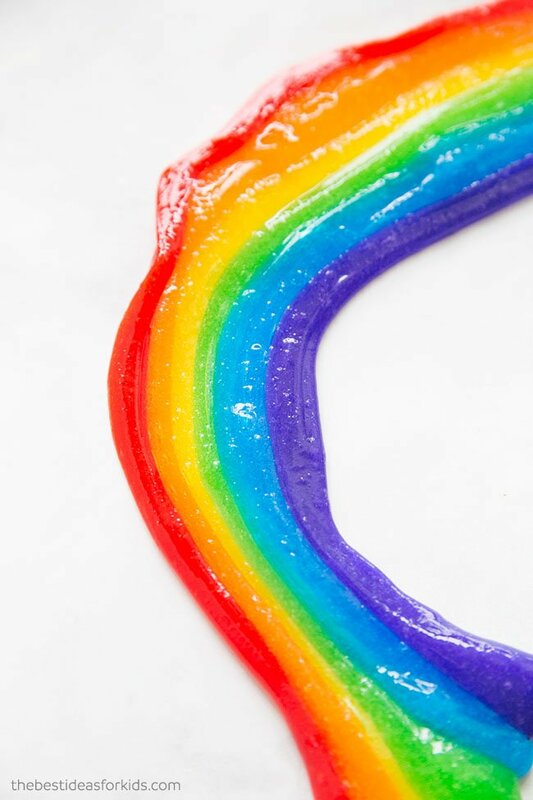 You can use this activity to teach about the science behind slime and also the science of rainbows. 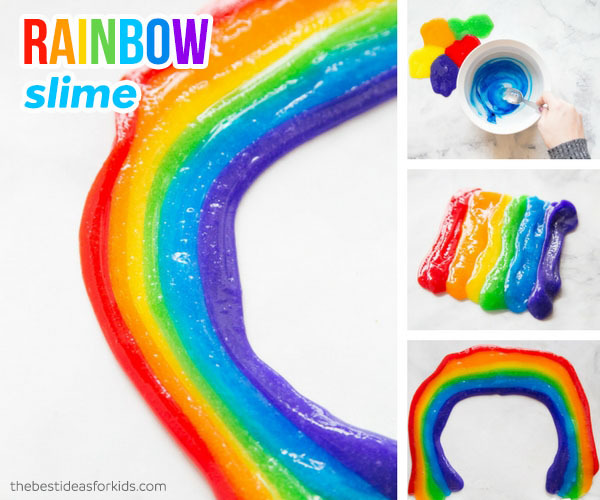 This is a good explanation of the science behind rainbows if you want to talk about it with your kids while you make this slime! Slime is actually a polymer because it has qualities of both a solid and liquid! Other examples of polymers are Jell-O, gum and rubber bands. White glue is also an example of a polymer. A polymer is made of long chains of polyvinyl acetate molecules. These chains slide easily making the substance like glue more easily poured. Here are the ingredients you’ll need to make one of the colors (if you plan to make all 6 colors you’ll need to repeat the recipe for each color you want to make). – 6 oz of Elmers Clear Glue – we like to buy this gallon size of clear glue as it’s a lot cheaper and you can continue to use it to make more batches. Note: We have only tested this with Elmer’s clear glue and recommend this brand as other brands may not work. You can also use Elmer’s white glue however the final slime won’t be as translucent looking. – 1.5 Tablespoons Contact Lens Solution – *Important: your brand of contact lens solution must have boric acid and sodium borate in the ingredient list. This is what interacts with the glue to form the slime. We like this brand the best. – Liquid Food Coloring – this set comes with all kinds of vibrant colors that you can use to make the slime very vibrant as shown. NOTE: We often add a little bit of water to our recipe but in this case, since you want to attach the slime together it’s easier if the slime is less stretchy. Therefore, we recommend skipping the water in this case. If you plan on just playing with the colors separately on their own then you can add water if you’d like. 1. Follow our step-by-step slime making instructions here. 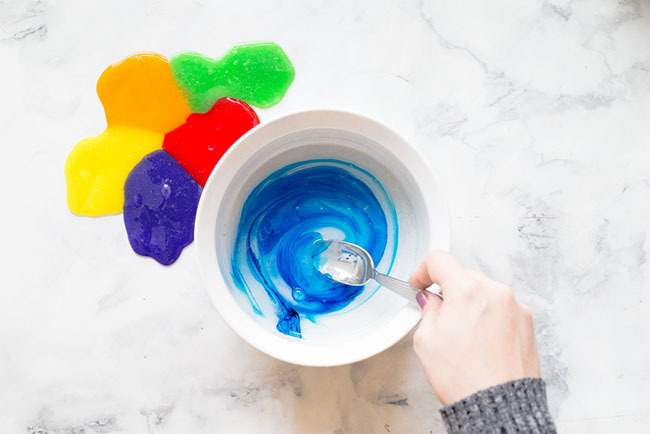 Important: skip the water in this recipe for making rainbow slime so it will be easier to attach the slime colors together. 2. You’ll need to follow the recipe and make 6 batches of the slime. One for each color. Separate them into separate jars before you make your rainbow slime. 3. Line up each color side-by-side. You won’t need to use the full batch of each color when lining them up, so keep some aside to do it a few times. Note: Once you start mixing the colors together they will likely turn brown. Anytime you mix slime colors, just like playdough, the colors do mix up. However, we find it is still fun to make different colors and mix them! 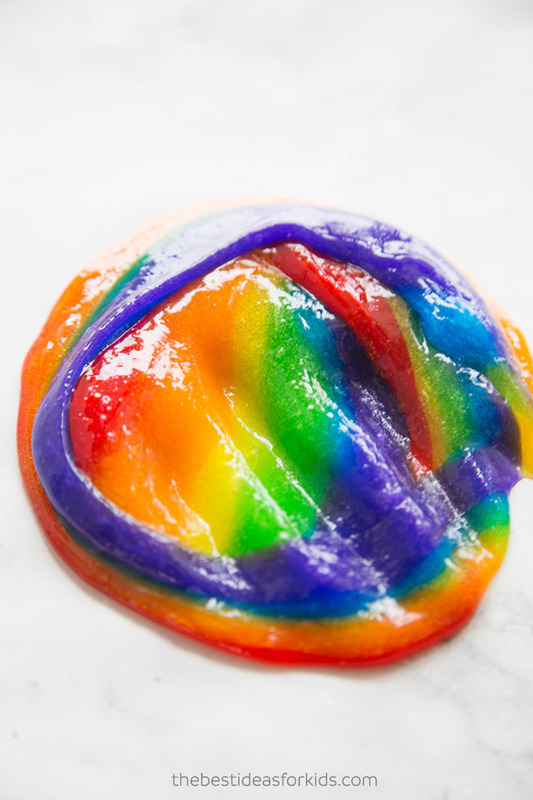 This rainbow slime recipe is colorful and made without borax! 1 bottle liquid food coloring (red, orange, yellow, green, blue, purple). 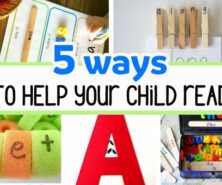 Or mix colors to create each color. Note: You'll need to repeat these instructions and ingredients for each color you'd like to make. This recipe batch will only make 1 color. 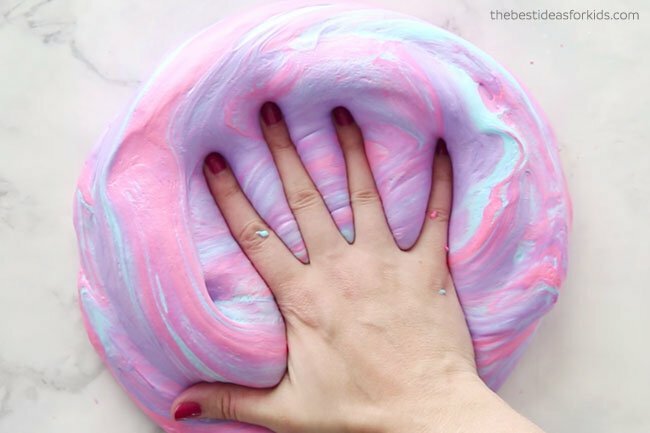 Pin this post for later so you can easily come back to make this slime! Have you tried fluffy slime yet? This is fun to make and the texture is “fluffy”! 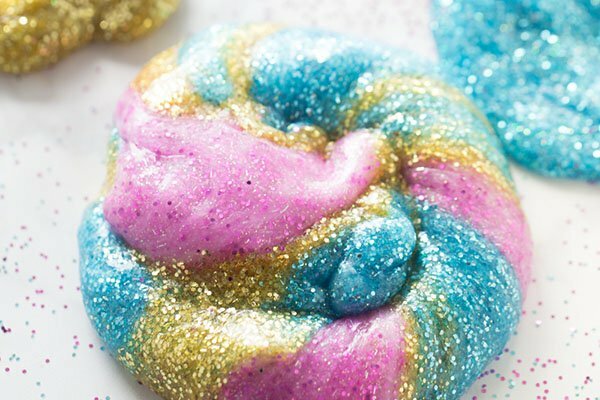 See our Unicorn Slime Recipe – our most popular slime recipe!